Unlike previous versions of Windows, Windows 10 includes more and more settings, configuration options, customizations and personalization in Settings app. In Windows 7 or earlier versions of Windows, all these settings can be found in Control Panel, while in Windows 8 and Windows 8.1, they are split between Control Panel and PC Settings app, though most of them could still be accessed in Control Panel. Not the case with Windows 10. For example, Windows Update is now exclusively in Settings. Though Windows 10 Settings is a kind of universal app, Microsoft does provide a way to access directly to specific individual settings page via ms-settings URI, which can be used in shortcuts – icons that can be placed on desktop, Start menu, Taskbar or any other locations with ability to assign keyboard shortcuts – for quickly access. Right-click or tap and hold on any blank place on the Desktop or File Explorer. 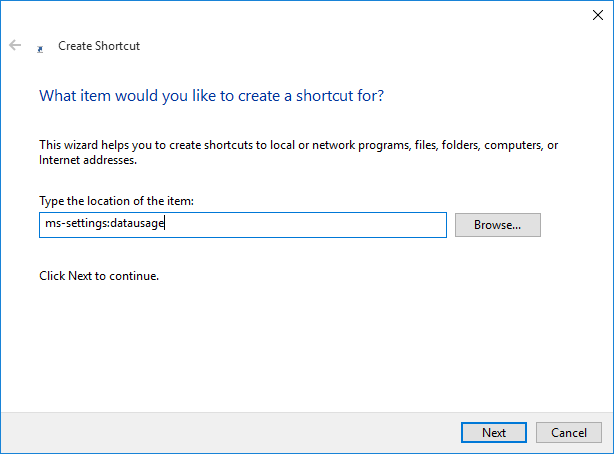 In the type the location of the item input text box, enter the ms-settings URI for the corresponding Settings page that you want the shortcut to open. Refer to the table below for the specific ms-settings URI. For example, to open the Data Usage Settings page, type ms-settings:datausage in the input text box. Click or tap on Next when done. 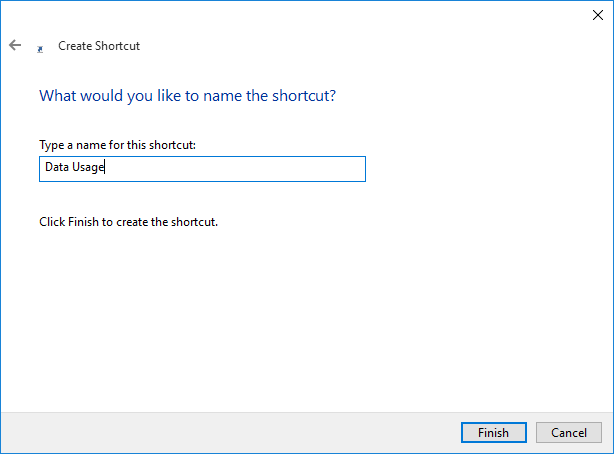 Give the shortcut a name. Click or tap on Finish button when done. That’s it. Double click or tap on the shortcut instantly go to the corresponding Settings app inner page. If you want to assign a keyboard shortcut to it, right-click on the icon created and select Properties. On the Web Document tab, go to Shortcut input box, press the keyboard shortcut you’d like to use, for instance Ctrl + Alt + D, and then hit OK. You can also move the shortcut to whichever location you prefer. Note: The Supported SKUs column indicates whether the settings page exists in Windows 10 for desktop editions (Home, Pro, and Enterprise), Windows 10 Mobile, or both.